This mobile UX training course is focused on user experience design considerations and processes when creating for touch and mobile devices. Learn mobile UX design principles to create apps and sites the meet user needs and business objectives. Understand various mobile and touch scenarios and how they differ based upon the environment, posture, and motivation. In this UX workshop participants identify specific uses and scenarios for mobile users, and then align those findings to UI suitable for mobile and touch devices. Mobile UX course participants learn to align feature sets specific to mobile use. Learn to effectively use mobile sketches, wireframes, and prototypes. Participants in this course should have completed the UX Design Principles course or have previous education or working experience in a UX role prior to enrolling in this UX course. Successful UX for mobile and touch devices requires designers to consider user scenarios which often differ based upon the environment, posture, and motivation of the user at the time. In this mobile UX workshop participants map out specific uses and scenarios for mobile users, and then align those findings to UI suitable for mobile and touch devices. Mobile UX class participants also create and align a feature set that is specific to mobile use and bring it to life in sketches, wireframes, paper and interactive prototypes. Participants in this course should have completed the UX Design Principles course offered at American Graphics Institute or have previous education or working experience in a UX role prior to enrolling in this UX course. You can take this mobile UX course in our classroom with a live instructor in the same classroom with you. It is available at our classrooms in Boston, New York City, and Philadelphia. These regularly scheduled, public UX workshops focus on mobile design and include small groups of professionals from various companies. A typical live mobile UX course involves a small group of between 6 and 10 participants, along with the instructor. These in-person mobile UX courses include both individual and group exercises, along with reviews of user experience projects conducted in class. These in-person courses are open to the public. We can also deliver a mobile UX session as a private UX workshop for your group or organization. This mobile UX class is also available as part of our live, online UX training from American Graphics Institute. The online mobile UX courses are conducted with a live instructor, and are also limited to a small group. You can hear and see the instructor and their presentation, talk with them, ask questions, and participate in individual projects. 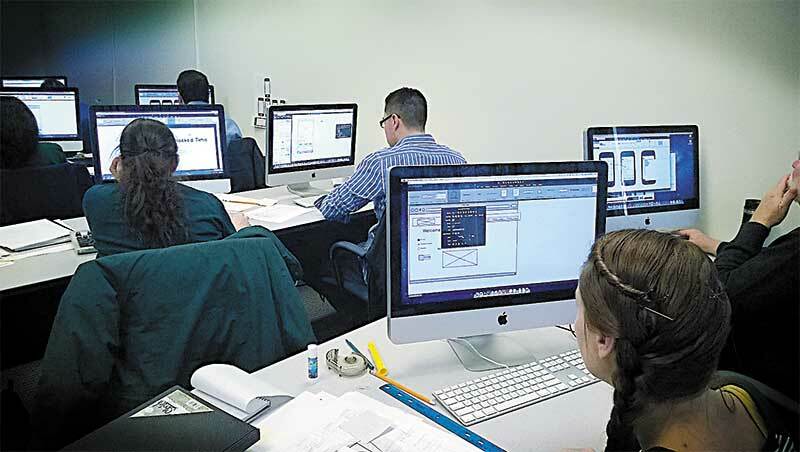 Both the in-person and online UX classes include the same lecture materials, and are led by the same team of experienced faculty from American Graphics Institute. Participation in this course requires either completion of UX Design Principles course or working experience in a UX or UI role. This course is also available as part of the UX Certificate Program offered at American Graphics Institute. This Mobile UX class is two-days in length if taken in our classrooms, or one-day if taken as a live online class. The classroom version of the course includes additional group projects and exercises that are not incorporated into the online course. The online course does cover all the same lecture material, and is led by the same UX instructors that deliver this course in the classroom.